Pumpkins, pumpkins, pumpkins! Whether they are in baked goods, coffee or homes as decorations, I just can’t get enough. As decorations, pumpkins have an additional feature. Carving Jack O’ Lanterns has an added benefit to their luminescent glow, seeds. The perfect opportunity to roast up some seasonal snacks. 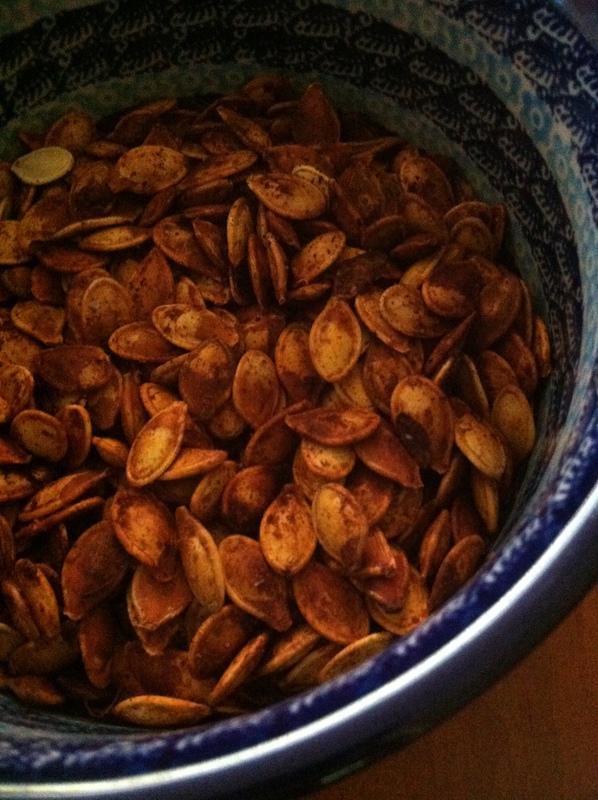 For years, I avoided tackling the seeds, opting to purchase them at the store. Mostly because of the time it takes to wash them and the inconsistency in baking them. For whatever reason, the insides would always turn out stringy. Now, though I’ve figured it out. Preheat the oven to 320. 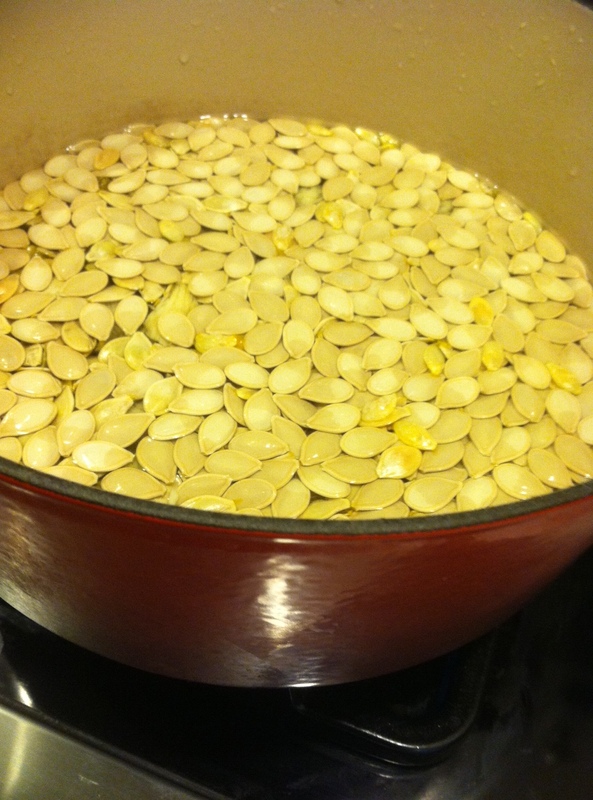 Remove the seeds from the pumpkin pulp. The easiest way to do it is put everything in a bowl of water. Mix it all together. And, the seeds will come loose from the rest. As my son B says, they float! So, you can just scoop them off the surface. Next, boil them in an uncovered pot of water with 1 tablespoon of salt. Boil for about 10 minutes. Strain. Dump on a baking sheet. I prefer the one by Chicago Metallic. Coat with seasonings. This can be a fun job for little hands. 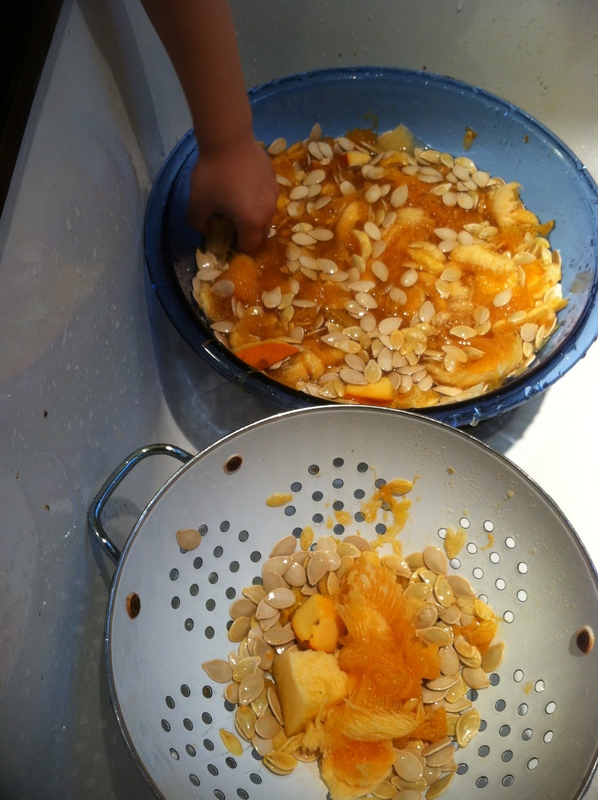 My boys loved getting their hands dirty by mixing the seeds and spices. Bake at 320 for about an hour, mixing around every 15 minutes. Let cool. Enjoy! My boys and even our sweet pug love enjoying these as a snack.